A horn coral named after William Borden whom Borden, Indiana was also named. Mr. Borden made a fortune mining silver in Colorado in the late 1800s and returned to Indiana. His geology collection became very large and after his death transferred to the Field Museum in Chicago. He might be best known for creating the Borden Institute and Museum to help educate youth in the southern Indiana area. This horn coral is actually two clustered together but 90 degrees out of phase. 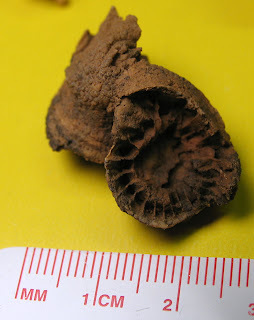 It is called Bordenia knappi and found in the Speed Limestone. It was found in Clark County, Indiana and the coral existed in the Devonian Period.